How the Final Four-bound Tigers can provide a blueprint for OSU. 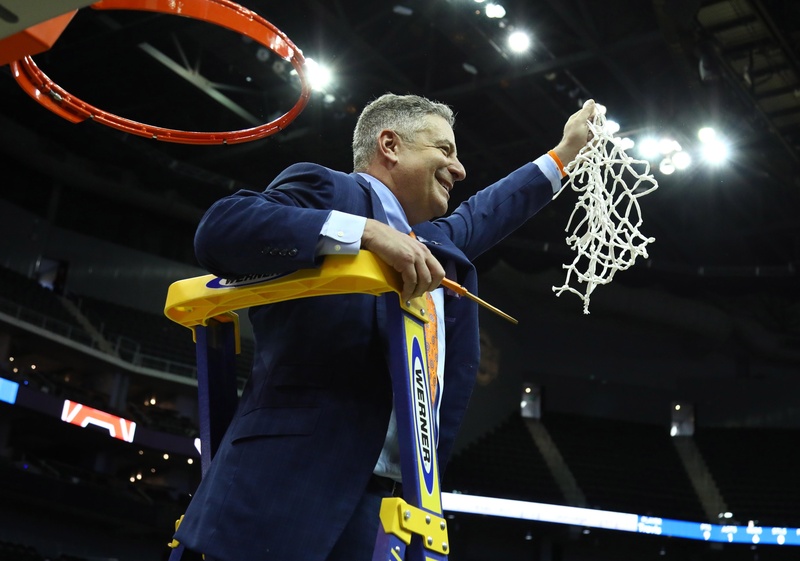 When Bruce Pearl took over at Auburn for the 2014-15 season, the Tigers’ success didn’t come overnight. After a meh first season, Pearl’s squad did worse in his second year before Auburn started its ascent to the Final Four. 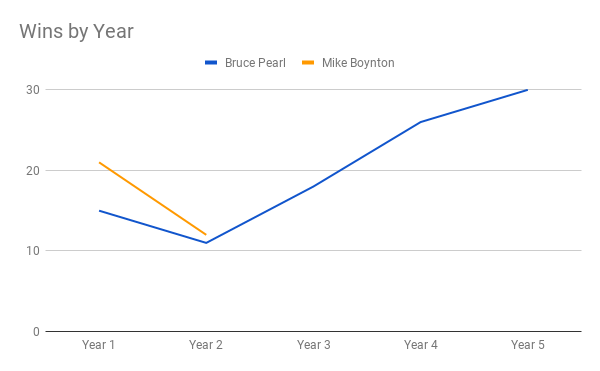 Oklahoma State had a promising first season under Mike Boynton before what would most politely be viewed as a set-up year this season. Are the Cowboys ready for an ascent to the magnitude Auburn had? That’s quite a stretch, but there are similarities in Boynton’s and Pearl’s tenures. Auburn’s first regular season under Pearl ended at 12-19. The Tigers lost 12 of their final 14 games. It looked to be a woeful year until Auburn won three games in three days to make the semifinal of the SEC Tournament to put some positive punctuation on the season. In Boynton’s first year at OSU, the Cowboys finished the regular season at 18-13. OSU then won a game in the Big 12 Tournament but still missed out on the NCAA Tournament. The Pokes picked up a couple of NIT wins to show some promise for things to come. In both cases that promise at the end of the previous season turned out to be a bit of fool’s gold. Auburn finished the 2015-16 season 11-20. This time the Tigers lost 11 of their last 13 to finish the regular season, but instead of an SEC Tournament run, Auburn got obliterated 97-59 against Tennessee in the first round. In Boynton’s second year, the Cowboys failed to even get back to the NIT after finishing 12-20. That’s where Boynton’s tenure is for the time being, but let’s move on with Pearl. In Year 3 at Auburn, The Tigers finished with a winning record for the first time under Pearl. At 18-14, Auburn didn’t make the tournament and were also left out of the NIT field, but it was the first step forward. The next year the Tigers went from taking a small step forward to a massive leap, finishing the regular season 25-6. Auburn lost in its first game at the SEC Tournament, but still made the NCAA Tournament where the Tigers beat Charleston in the first round before losing to Clemson in the Round of 32. That brings us to this season. The Tigers have won 30 games, an SEC Tournament championship and are in the Final Four this weekend. Auburn’s success this season isn’t by accident, but rather staked years of solid recruiting classes. How Auburn obtained that recruiting success has somewhat come into question, as Danjel Purifoy and Austin Wiley each served suspensions following the FBI’s investigation into college hoops. That investigation also led to former-Auburn assistant Chuck Person being fired. Regardless, Pearl’s 2015 class (coming after his first season at Auburn) was ranked 16th in the country. That class included Horace Spencer, Purifoy and Bryce Brown. Spencer and Purifoy were each top-100 recruits, and Pearl struck gold with Brown, who as a senior leads the Tigers with his 16 points a game this season. Brown was the 369th-ranked recruit in the 2015 class. Is that outstanding evaluation skills or luck? Probably a bit of both. The following year, Pearl had the 12th-ranked class, one that included Jared Harper, Wiley and Anfernee McLemore, and the year after that, Pearl’s 2017 class included Chuma Okeke. Those classes are better than what Boynton has been able to put together to this point, something that comes with a coach that has the pedigree and experience of Pearl. An understated asset of that Pearl’s build is that it includes good, four-year players. The Tigers rank 36th in the country in experience, according to KenPom. That makes them one of the top high-major schools in that category. All of this season’s Final Four teams have solid upperclassmen, which can be an underrated thing in this one-and-done era of college hoops. The Cowboys ranked 293rd in experience this season, but two years ago Auburn finished 332rd in the category, the year the Tigers went 18-14. So, how does Boynton build something similar? Well, he is off to a good start. Isaac Likekele and Yor Anei showed incredible amounts of promise in their freshmen seasons. Boynton continued that with his 2019 class. Marcus Watson, Avery Anderson, Kalib Boone, Keylan Boone and whomever else gets added are going to add a lot to next season’s team, and they’ll only get better with every year they’re on campus. Retention will be important, and with how much fluctuation Boynton has had in his first two rosters, that aspect will be under a microscope moving forward. Pearl has dealt with roster shifts at Auburn, as well. From Pearl’s 2015 class, New Williams left Auburn for Fresno State after a season. From his 2016 class, Mustapha Heron left for St. John’s after two seasons at Auburn. Heron was the 22nd-ranked recruit in the country coming out of high school. And from Pearl’s 2017 class, Davion Mitchell left for Baylor after a season after coming to Auburn as the 59th-ranked recruit in the country. Those are some substantial losses, maybe not losing four players in the span of a month, but substantial nonetheless. Pearl didn’t come to Auburn and flip the program in a season. It took some doing — five years of doing. This doesn’t necessarily mean Boynton and OSU are on the same trajectory, but there are similarities. For every coach who had a bad second year to a better third year, there’s a coach who had a bad second year and another bad third year. It’s definitely a matter of could than will. There’s obviously more to this than recruiting and watching time pass, but Boynton has showed he can coach, too. He beat Bill Self twice last season. He is 3-1 against Bob Huggins. He took a Final Four Texas Tech team to overtime in Lubbock. Boynton has showed plenty of reasons that he is capable of building something similar to what Pearl has built in Auburn. If Boynton can not only bring classes of the caliber of his 2019 class to Stillwater, but also keep the players there the slow rebuild could turn into something more.